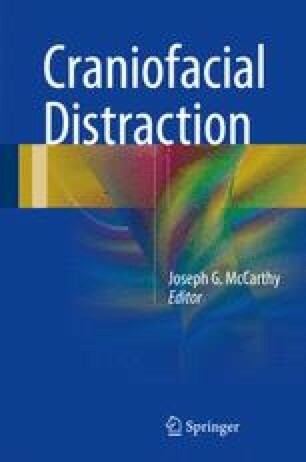 The original experimental studies and clinical experiences in craniofacial distraction were focused on the mandible. Ilizarov  had popularized the modern concept of bone lengthening or distraction osteogenesis of the appendicular skeleton but had ignored the craniofacial skeleton. While there had been experimental reports of attempts at mandibular lengthening [2, 3], it was the detailed canine studies from New York University [4, 5] that first raised the clinical feasibility of mandibular distraction, later confirmed by the original 1989 cases reported in 1992 . The Mexico City group, led by Molina and Ortiz-Monasterio, reported a larger series of mandibular distraction cases in 1995 .